Sr. Soledad (Ester Y. Hilado) was the third of nine children born to Attorney - later, Justice - Emilio Y. Hilado and his wife, Soledad Yulo-Hilado. She entered the convent on December 8, 1947, without her parents’ knowledge and permission. She had only left a letter for her parents, with a gift for each parent, with a priest-friend of the family, to be given to them after she has entered. Leaving home was hard for Sr. Soledad, as her mother was not well, but she had wanted to give herself to God since she was little. While her father supported her choice, and visited several times, her mother was only able to visit her once, for she died eight weeks to the hour after Sr. Soledad entered the convent. God gradually provided Sr. Soledad with skills and experiences for her mission. Graceful, gentle and genteel, Sr. Soledad was a swimmer, ballet dancer, a lover of music, reader of books and novels. With a PhD in education, she made notable contributions in the field of education, where she served over the years in various capacities in our schools: as secretary, teacher, Moderator of the Sodality and the Student Catholic Action, Dean of Student Affairs, Dean of College, Directress, Superior of the community and College President. She was instrumental in the founding of the Philippine Accrediting Association of Schools, Colleges and Universities (PAASCU) and served for many years in the Board of the Catholic Educational Association of the Philippines (CEAP) and as Executive Director of the Association of Benedictine Schools (ABS). Sr. Soledad established SSC’s Research and Development Foundation (SSRDF), which gives scholarships to poor but deserving students. Sr. Soledad also served the Priory generously, serving at various times as the Priory Prefect of Studies, Priory Planning Officer, Congregation and Priory Historian. Sisters remember with gratitude her gift of seeing potential in the Sisters, and then gently mentoring and encouraging them until they finished their studies. With her gifts of organization and discipline, she has ensured the success of General and Priory Chapters, which she served as Chapter Coordinator or Chapter Secretary. She was also missioned to Western Australia from 1985-1987, where she was Education Officer and Assistant to the Head of Religious Education and School Services Division. Accomplished as she was, Sr. Soledad mentioned none of her professional achievements in the obituary that she wrote on herself. She had written it in response to a request from her superior. In it, she talked of her desire to be in heaven with God on her First Communion day, and of how God met her “in different places and different ways” throughout her life. She spoke of how she met God in a different way during the more than seven weeks she was in the hospital in Rome, an event that would drastically change her “lifestyle,” for that began a long road marked by repeated health crises and hospitalizations. The experience of the years of ill health that followed only filled Sr. Soledad with a deep gratitude for the loving care she received from her “doctors, the Sister-infirmarian, the rest of the Sisters, friends and family.” She remained close to her family, students and friends, remaining interested in their triumphs and failures, praying for them and loving them to the end. 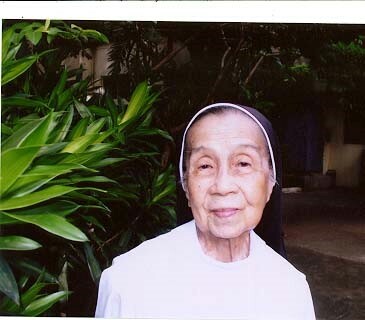 Sr. Soledad passed away at 5:00 AM on February 10, the Solemnity of St. Scholastica. She had seen a bird/birds in her hospital room, telling the Sister-infirmarian that she was being invited “to join” them. It was finally St. Scholastica that accompanied her to the Father, but surely the Blessed Mother whom Sr. Soledad was so devoted to, would have been there as well, to welcome her with joy. We recommend our beloved Sister to your prayers.